The breeding loft became a lot stronger with the introduction of the old foundation pairs in 1987 of Joh. van Riezen of Lippenhuizen a small village up north in the dutch province called Friesland. These birds came out of a collection of pure inbred birds of the Willequet Brothers of Kwaremont (Belgium), the very same loft where Gaby Vandenabeele got his foundation birds too. Their bloodlines go straight back to the famous birds of Alois Stichelbaut. A very important bird in this colony is the famous "08" of the Willequet brothers. This supercrack won three times within the first 15 prizes International up to St. Sebastian (1000 kms). Van Riezen bought his birds direct from Willequet, off Georges de Jaeger from Melden (his "Pursang" is worldfamous) and off Stan Jacobs (Piet de Weerd describes him often in his books); last two fanciers did it with the pure Willequets. It is no secret that Jef Carlens from Zepperen (two times National Barcelona winner) bought his first class birds direct from the Willequet brothers. Joh. van Riezen kept these birds during several generations close together in perfect quality. 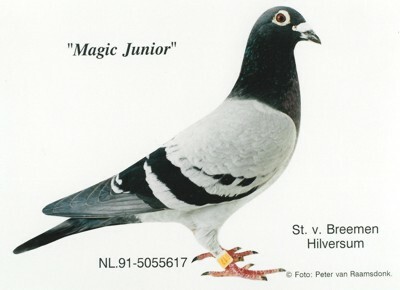 His excellent racing performances were wellknown in the Northern part of Holland were St. Vincent is 1200 kms. Three years in a row Van Riezen had the fastest three bird team in the National Munchen race over 750 kms!! "De 118" 10th St. Ghislain 13193 birds; 48th Peronne 22276 birds; 82nd Nat. Orleans 23546 birds etc. "De 202" 21th Soissons 4089 birds; 75th St. Ghislain 8061 birds; 14th Nat. Orleans 23546 birds etc. "De 116" 37th Peronne 22276 birds; 27th St. Ghislain 8061 birds; 34th Chateauroux 1852 birds. The superbreeder of Pilunthanakul brothers in Bangkok father of a National winner plus 1st Ace Long Distance of Thailand. They are also close family to the National Montauban winner in Belgium and the 1st Nat. Ace 1986!